Applications include feeding product to a machine such as a case sealer at a specified rate, or to hold all items to be shipped on a given truck until that truck is ready to be loaded. Accumulation is similar to power roller conveyor with important exceptions. The drive pressure on the product can be adjusted to a minimum, or even eliminated altogether. This is useful when a long line of cartons have to be accumulated without pressure so that they can be utilized in a process such as loading, sorting, taping, strapping, palletizing, or picking. Zero pressure conveyor prevents product from touching. Sensors detect product held at the end zone and keep all product from moving forward until the end product has been released. 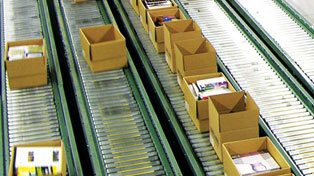 Upon release, products move in a well-spaced sequence into next holding slot.